the junction between the processes of two neurons or between a neuron and an effector organ, where neural impulses are transmitted by chemical means. The impulse causes the release of a neurotransmitter (e.g., acetylcholine or norepinephrine) from the presynaptic membrane of the axon terminal. The neurotransmitter molecules diffuse across the synaptic cleft, bind with specific receptors on the postsynaptic membrane, causing depolarization or hyperpolarization of the postsynaptic cell. See also neuron. Components of a synapse. From Applegate, 2000.
axoaxonic synapse one between the axon of one neuron and the axon of another neuron. axodendritic synapse one between the axon of one neuron and the dendrites of another. axodendrosomatic synapse one between the axon of one neuron and the dendrites and body of another. axosomatic synapse one between the axon of one neuron and the body of another. dendrodendritic synapse one from a dendrite of one cell to a dendrite of another. electrotonic synapse a special type of gap junction found in tissue such as the myocardium. the synaptic junction between an axon terminal of one neuron and either the initial axon segment or an axon terminal of another nerve cell. a synapse in which the axon of one neuron comes in contact with the axon of another neuron. the junction between the processes of two neurons or between a neuron and an effector organ, where neural impulses are transmitted by chemical means. The impulse causes the release of a neurotransmitter (e.g. acetylcholine or norepinephrine) from the presynaptic membrane of the axon terminal. 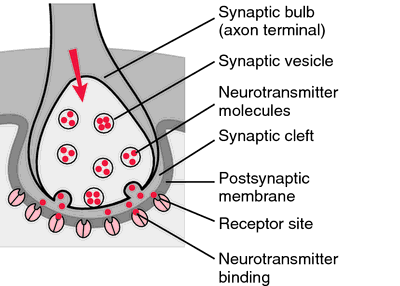 The neurotransmitter molecules diffuse across the synaptic cleft, bind with specific receptors on the postsynaptic membrane, causing depolarization or hyperpolarization of the postsynaptic cell. See also neuron. the neurotransmitter is norepinephrine. See also adrenergic (1). one between the axon of one neuron and the dendrites and body of another. the neurotransmitter is acetylcholine. See also cholinergic. one from a dendrite of one cell to a dendrite of another. a synapse in which the transmission of impulses is electrical not chemical. Found only in fish and invertebrates. hyperpolarizing electrical current is used to raise the threshold for the stimulation of a discharge of an impulse from the particular kind of nerve cell, found only in fish.